Piano lessons used to have a reputation for being rather stuffy, formal affairs, taught face-to-face by austere types who had never quite got over the fact that they never made the grade as musicians themselves. However, if you want to learn piano in 2019, the options open to you are many and varied. You could, of course, go down the traditional route and get ‘real’ piano lessons locally, and this is still, arguably, the most effective way of doing things. You’ll learn in a logical and structured way, probably taking weekly lessons and practising in between. One-to-one tuition has big advantages: with the right teacher, you’ll get useful, focused feedback, and be inspired to keep going when things start to get more difficult. However, it can be expensive, and you’ll probably have to commit to taking a lesson at a specific time each week, which might be a problem for you. In search of alternatives, many people try and learn piano by watching YouTube videos. While we can see the appeal of this method - it’s free, there are loads of ‘lesson’ videos to choose from, and you can focus on learning the songs you really want to play - there are problems with it. For a start, a lot of the videos aren’t accurate, while others are badly shot with poor sound quality. What’s more, the videos are often lacking in structure; you might learn which notes to play, but you won’t get much insight into the theory behind what you’re doing. It’s very much a case of ‘how’ rather than ‘why’. Which brings us to the best way to learn the piano online: a dedicated software package. This could be seen as a ‘best of both’ worlds way of approaching things - you’ll get the structured learning that you would from a real teacher, but you’ll be able to take the lessons in your own time and from the comfort of your own home. The majority of piano teaching software runs on PC and Mac, while other titles are also compatible with iOS and Android devices. In most cases, you’ll get the most out of your software if you use it in conjunction with a MIDI keyboard. Plug this in and the software will know when you’re pressing each note, so you’ll be able to see precisely which notes you’re hitting correctly, and which ones you’re missing. Typically, you’ll also be graded on your playing. Co-created by music legend Quincy Jones, and with tutors including one Harry Connick Jr, Playground Sessions feels like everything a video-based piano learning app should be. Not only will you learn to play your favourite piano songs, but you’ll also get a good grounding in music theory, while charts and graphs enable you to track your progress and show you where you need to improve. Assuming you’ve got a MIDI keyboard plugged in, Playground Sessions is fully interactive - you get visual feedback that makes it clear which notes you’re playing right/wrong, and if you’ve got the rhythm right - and the whole experience has been ‘gamified’ to make it as much fun and addictive as possible. You can try and beat your best scores and earn rewards to level up, unlocking more content. If you want to learn the piano on your computer or iPad, Playground Sessions is definitely one of your best options. Another slick offering, flowkey has the cooperation of Yamaha, and you’ll get a three-month premium membership if you buy one of the company’s pianos. The ultimate goal is that you’ll be able to play your favourite piano songs, but in order to get to that point, you’re also offered a selection of piano lessons. As is customary, you’ll learn about left- and right-hand playing, before bringing your hands together and playing chords and melodies. 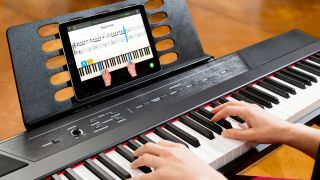 You can learn on your PC/Mac or mobile device (iOS, Android and Windows) and there’s note recognition via MIDI or your computer/tablet’s built-in microphone. This facilitates accurate visual feedback on your playing, and you can slow down or loop sections of music when things get difficult. Whether you’re a beginner, intermediate or returning piano player, flowkey can help you to get better. If you’re just starting to learn the piano, Skoove can help you out with its interactive Beginner and Intermediate courses, and you can then take your playing in a Pop or Classical direction with further tuition. The software follows a ‘listen, learn, play’ blueprint, with the theory being that this will help you to master new playing skills quickly. Once you’ve mastered the basics, there’s advice on how you can start to improvise, and there’s also an emphasis on the importance of good technique. The interface is clear and easily-understandable, showing you which notes to play at what time, and note recognition is via your PC/Mac or iOS device’s mic or MIDI input, so pretty much any type of piano or keyboard should be compatible. On the downside, some of the songs you learn have been simplified to a point where they don't sound as much like the originals as you might want them to. However, the Skoove method is simple and effective: if you’re willing to put the time into learning and practising, it’ll take you where you want to go. The clue to ArtistWorks’ MO is in its title - this is a teaching site that puts the credentials of its tutors to the fore. Piano is just one of the many instruments you can learn, and as well as being able to take jazz, classical and pop lessons, you can also send videos of your playing to your tutor, who’ll then offer their feedback in a response video. These interactions are shared with other ArtistWorks users (and you can see theirs, obviously), so a library of personalised advice is being built up all the time. So, if you like the idea of one-to-one learning, ArtistWorks is definitely worth a look; you can sign up for a free lesson if you want to test the water. Pianoforall is a little different from many other piano learning solutions in that its self-proclaimed goal is to teach you to play by ear, improvise and compose. That will be (piano) music to the ears of those who’ve struggled with more traditional learning methods in the past, but that isn’t to say that there’s no structure here. There’s a strong emphasis on learning chords and seeing shapes and patterns on the keyboard, which could certainly help you to learn the songs you want to play quickly. That said, you will be taught to read music as well, but not in a traditional way. Pianoforall will also appeal to those who don’t want to pay an ongoing subscription fee for their piano lessons. A one-off payment gets you all the content (either via download or DVD) plus lifetime free updates. ‘Created by piano teachers for piano students’ is the tagline here, so we’re off to a promising start. Piano Marvel is best used in conjunction with a MIDI-capable keyboard; this ensures that you can get instant feedback on your playing and see where you’re going right and - perhaps more importantly - wrong. You’re graded on your playing, too, and your can win trophies and track your progress. The learning is structured, but you can move at your own pace, and once you’ve got a handle on the basics, you can start learning the 1,000+ performances in the library - all included in the price of your subscription. That said, there’s also a free account option to get you started, so give it a go and find out of the Piano Marvel method works for you.